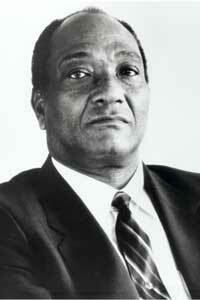 Edward Perkins, the first Black Ambassador to South Africa, was nominated U.N. Ambassador on this date in 1986. Edward Joseph Perkins (born June 8, 1928) is a former American diplomat. He served as U.S. Ambassador to Liberia, South Africa, and the United Nations 1992-1993. He was later Director of the US State Department’s Diplomatic Corps. Perkins was born in Sterlington, Louisiana, son of Edward Joseph Perkins, Sr. and Tiny Estella Noble Holmes. He grew up in Pine Bluff, AR and graduated in 1947 from Jefferson High School in Portland, Oregon. He earned his B.A. from the University of Maryland University College in 1967, and his M.A. and Doctor of Public Administration from the University of Southern California. He is an active member of Kappa Alpha Psi fraternity and holds the highest honor the fraternity bestows on its members, the Laurel Wreath award.